Alex Chiu works as a storyboard artist at Marvel Animation with a BFA and a passion for animation. 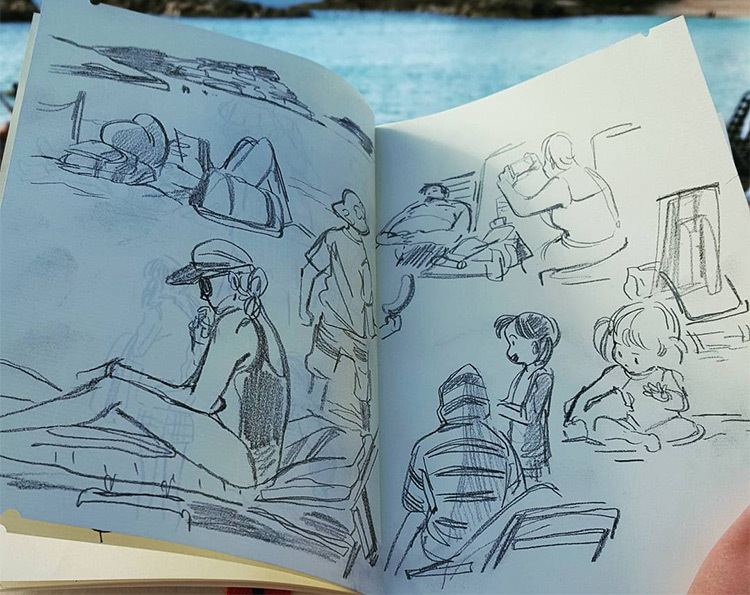 In this interview she shares her journey as an artist & some tips for aspiring story artists. 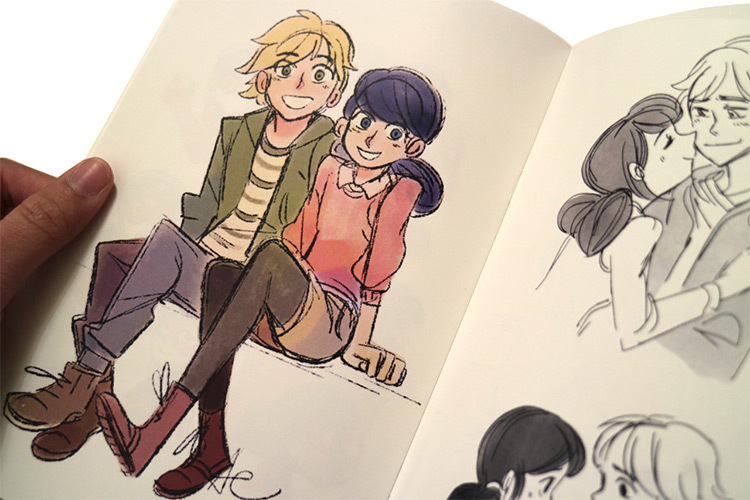 You can find tons of her sample sketches on Tumblr and browse through more detailed work on her portfolio site. But without further ado here’s the interview! When did you first start drawing and at what point did you seriously consider art as a career? I always doodled as a kid according to my parents. But I didn’t really pick up the pencil and draw everyday with the intention of getting better in some shape or form until I was 10. It all changed when I started reading manga haha! I considered it when I was in high school and deciding where I wanted to go to school… but I don’t think it was until sophomore or junior year of college when I narrowed down my career path to art. 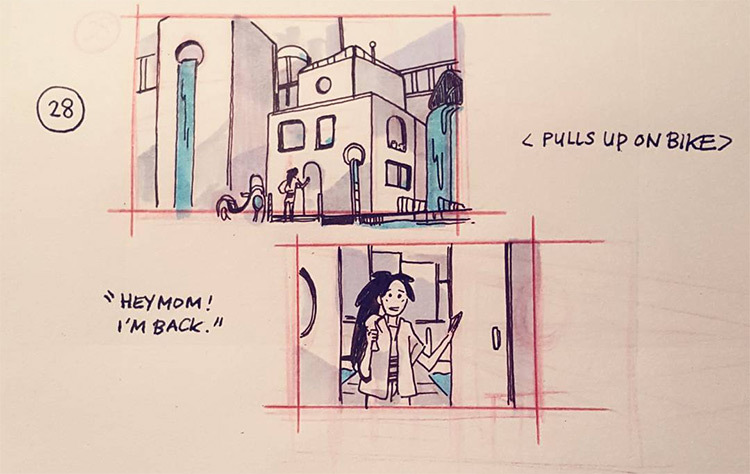 Did you study storyboarding in college or did you mostly teach yourself? And was it a difficult skill to pick up? My school had a focus in illustration, so there were no specific classes on how to storyboard and the technicalities behind it. On the other hand, school taught me how to think creatively, flexibly, and how to stretch that storytelling muscle through comics, illustration, and optional film projects. I took online classes while I was in school to learn the technical skills required. What games, movies, or other media inspires you the most? Oh gosh, where to even begin? This is always my favorite question to answer. Growing up I liked manga/anime a lot. Fullmetal Alchemist is my favorite manga because it’s got everything I ask for in a story. Arakawa’s draftsmanship is incredible, and her panel planning is so well thought out and so well composed. I also like the Pokémon manga, especially the drawings by the first artist Mato. Her work is full of so much charm. The Legend of Zelda series is my favorite videogame series, especially Majora’s Mask. I love the themes, how it relates to the series as a whole, and the gameplay is top notch. The 3D remake is beautiful too! As for anime, Samurai Champloo and Kiki’s Delivery Service are my top choices for their aesthetics and the themes. Big classics like Akira and Ghost in the Shell are great, and Cowboy Bebop is probably just… a perfect TV series. It’s got everything! The Incredibles is one of my favorite movies and definitely my top pick for animated movie. As for live action, I think I’m a sucker for historical & sports dramas/movies that take a stab at existing events(i.e. Lincoln, Imitation Game, Remember the Titans, and an old favorite Glory Road). Generally speaking though, all of the stuff I listed above are things I look to because they have aspects I like. If you’re looking for good films, go through the Top 100 AFI list, Oscar winners, etc. In terms of other things that inspire me, I’d say real life events and experiences. Whether it be politics, the experiences I share with my friends and family, the feeling I get after I watch a good movie—stuff like that always sparks ideas for me! What’s the story behind getting your job at Marvel Animation? Is there anything about the job that surprised you or was difficult to pick up at first? The summer of 2015 I was testing for a bunch of shows, most of which didn’t work out. Some I didn’t hear back from, some responded with a rejection. None of which was ever a bad thing in the long run because it was all a learning process! I was always grateful people gave me a shot in the first place. The funny story about my job at Marvel was that they found me through Tumblr, saw that I had a portfolio, and asked if I’d like to take a storyboard test. Of course I said yes! So I took the storyboard test and it was a good fit. But as far as things that surprised me? Oh man! For starters, I was so stunned at how good everyone was at drawing. My coworkers’ draftsmanship was unbelievable! I 1) felt really behind 2) jokingly thought to myself “how did I get hired?” But most importantly 3) was really inspired to improve so I could catch up to my peers and contribute to the team in more productive ways. I think that’s the wonderful thing about this industry. There’s always room to grow and to learn from your peers. How much collaboration goes on between Marvel story artists & writers/directors? I work with my director super closely. Usually we have meetings at the beginning of every episode to go over ideas, any story problems in the script, etc. I try and check in often to make sure that we’re on the same page! Are there any books, courses, or learning resources that you’d specifically recommend for aspiring story artists? I took Rad Sechrist’s online storyboarding class twice, and a CGMA storyboarding class once during school. All were great experiences! I highly recommend Rad’s class for beginners. He’s a great teacher, super concise, and oh my gosh, seeing him flip through his storyboard samples was such a mind-blowing experience! For some additional learning resources check out Scott Eaton’s Bodies in Motion site. It’s full of a variety of poses and the in-betweens for each pose—like a figure drawing class that’s there forever and that you don’t have to go to in real life… which doesn’t mean don’t go to figure drawing because that’s HUGELY important! And of course, study film. What’s fun about boarding to me is that the reference is all out there. Look at films you like. Observe the framing and why & when they cut to the next shot. How much focus do you place on life drawing or realism in your practice? Do you see more artistic improvement while working from imagination or from life? But definitely, you have to know how to draw. Once you have the fundamentals down then you can choose where to simplify, etc. At the same time don’t let that deter you from flexing that creative muscle, because as a board artist you first and primary objective is to work as a problem solver. What skills does someone need to become a professional story artist? Is it necessary to learn animation too? In terms of drawing ability draftsmanship is key. But the ability to draw fast and clear and a huge variety of poses and expressions is very important. Actually, you pretty much have to be able to draw anything quickly and clearly because you never know what kind of script/elements in a script will be thrown at you. It’s not necessary to learn animation, per se, but these days board artists are practically keyframe animators. I think it’s important to watch a lot of animation to help you better envision movement arcs for your scenes. What makes a great storyboard portfolio? What should an aspiring storyboard artist put in their portfolio to best showcase their work? In my opinion: clear and fun storytelling, and then drawing ability. Your drawing ability serves as a clarification vehicle for your storytelling skills. Does the expression that you’re aiming for read? Does the gesture convey what you want? Does it look like an upshot and is your shot choice is clear? All of these things are important supplementary tools to a clear and fun story! How can you draw your audience into the story with tiny little frames? I think typically you want to showcase a bit of variety. Action, comedy, and drama. If you can hit all 3 of those beats in, let’s say, 1 large sequence and 1 or 2 additional shorter ones then that’s pretty good. But don’t forget to keep it short and sweet. Recruiters look through hundreds of samples everyday so you can’t drag them on for 100 pages of a PDF! Finally what advice would you give to your younger self or to other aspiring story artists? Don’t be afraid to try things. Seriously. People forgive you for mistakes when you’re young, and people also understand that when you’re younger you’re still figuring out what you want to do. It’s okay if you don’t! The whole thing is a process and you can only learn if you make a mistake and learn from that mistake. I didn’t even know what storyboarding was until my junior year of college? Which isn’t a bad timeline, but prior to that I was trying a bunch of things. 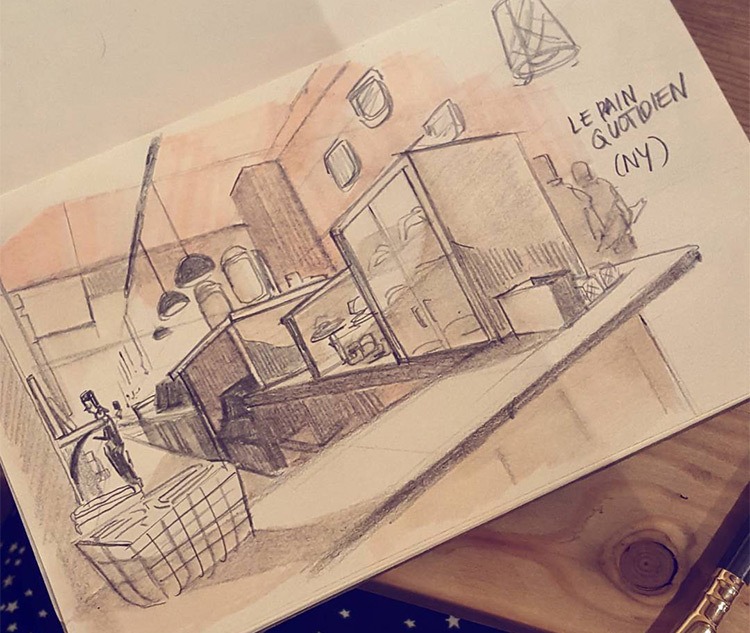 I thought I wanted to be a graphic designer, a politician [laughs in the distance], a children’s book illustrator, a visual development artist[louder laugh in the distance]… until I realized that I was awful at making finished drawings, hahaha! But also that storyboarding was my favorite aspect of the animation pipeline. And ask genuine questions, and questions that you can’t answer yourself. Not stuff like ‘what brush do you use’ but why not go a step further? There’s a reason people choose the mediums that they like. If you ask someone what tools they use, and if you ask why, you’ll get a better answer. But at the end of the day… be yourself. As a personal anecdote: in high school a bit and in college, I was afraid to like anime. I thought I had to exclusively like Disney and that enjoying series like Naruto and One Piece was a bad thing. It took me a while to accept and understand that there are a lot of people that like both, and that’s totally fine! Special thanks to Alex for taking the time out for this interview & sharing her advice. If you’d like to learn more you can visit her website to find storyboard samples and links to her social accounts. And you can find lots of Alex’s drawings on her Tumblr page which gets updated pretty frequently.